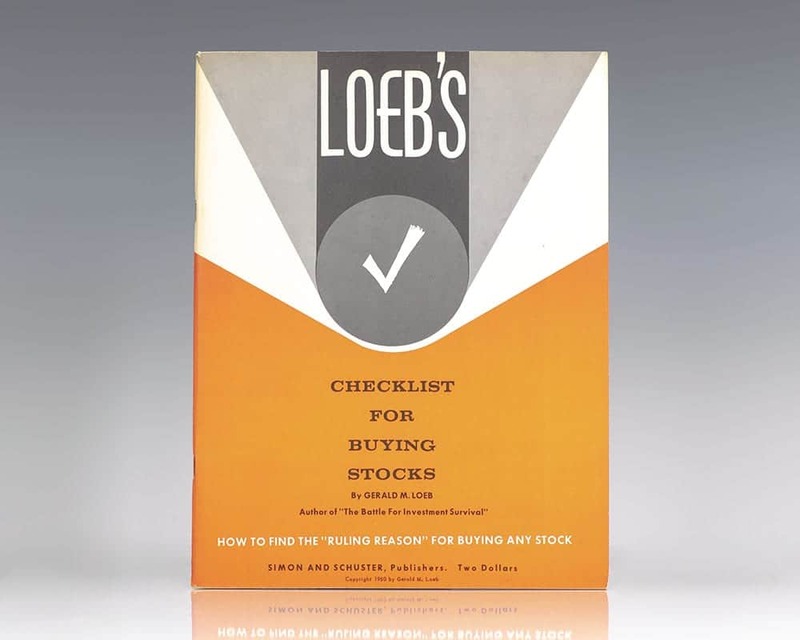 Loeb’s Checklist For Buying Stocks. New York: Simon and Schuster, Publishers, 1960. Rare first edition of Gerald Loeb’s checklist for stock picking. Quarto, original wrappers, 40 pp. In near fine condition. Gerald M. Loeb was a founding partner of E.F. Hutton & Co., a renowned Wall Street trader and brokerage firm. He was the author of the books The Battle For Investment Survival, which sold over 200,000 copies during the Great Depression. updated the book in 1957 and 1965, as it attained the status of a classic financial text. and The Battle For Stock Market Profits. Loeb promoted a view of the market as too risky to hold stocks for the long term in contrast to well known value investors. He also created the Gerald Loeb Award, given annually for excellence in various categories of financial journalism. Rare first edition of Loeb’s pamphlet on investing. Octavo, original wrappers as issued. In very good condition. The Battle for Stock Market Profits (Not the Way It’s Taught at Harvard Business School). First edition of this classic work on high-risk investment for maximum profit, including the Loeb Checklist for managing stocks. Octavo, original boards. Fine in a near fine dust jacket with light shelfwear. Signed by the author on the front free endpaper. Housed in a custom half morocco clamshell box.